Lindsay Katchky had her first volunteer experience in high school, when she travelled with a group of students to West Virginia to take part in a Habitat for Humanity build. Having the chance to see the results of her efforts laid the foundation for a love of community service. Katchky, a third-year undergraduate student in the Bachelor of Medical Sciences program with dreams of pursuing dentistry, volunteers for Making Waves London. 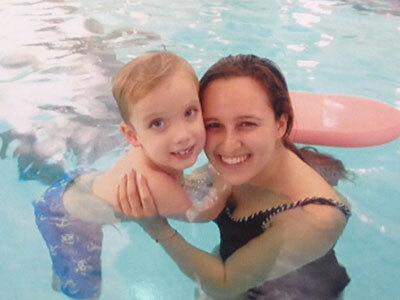 The organization provides affordable and accessible swimming lessons for children that have disabilities. Making Waves offers a vital service. Studies have found that drowning is the second leading cause of injury-related death in children, and that children with disabilities are 10 times more likely to fall victim to submersion injuries. Lessons for special needs children are also about four times more expensive than other programs, so for families that are already burdened with extra costs this can be prohibitive. The program attempts to match volunteers with the same child for the duration of their lessons in order to establish a meaningful connection between the volunteer, the child, and the child’s family. Katchky has been working for the past three years with a five-year-old boy named Kingsley, and she considers herself very lucky to have been paired with such a special individual. He has spina bifida, meaning he has no mobility from the waist down and requires a wheelchair to move around. They meet once a week for a 30-minute lesson. For the first 15 minutes Kingsley wears what is known as a puddle jumper for assistance. Puddle jumpers resemble a lifejacket with water wings. “Because Kingsley uses his arms so much to get around in his wheelchair he is actually very proficient with the puddle jumper on, and usually beats me when we race around the pool,” Katchky said. For the second half of the lesson Kingsley ditches the puddle jumper and Katchky helps him swim around the pool. The ultimate goal for Kingsley is to get him to swim on his own. “I’ve discussed it with him and his family and we think we can get there,” she said. Kingsley had a breakthrough in mid-January of this year when he put his head underwater for the first time. Katchky had broached the subject with him before but he was always nervous and would ask her to go first. It has been Kingsley’s wonderful attitude that has made this all worthwhile for Katchky.